Each year, millions of wooden pallets end up discarded in land-fill sites. Re-using them for garden projects is a great way to cut down on waste and will ensure your garden really is the greenest of them all. Your garden is an important factor when it comes to creating a good impression and sprucing it up on a budget may be easier than you realise. Pallets can add a rustic feel to a garden and are the perfect size for using as planters. If you have a passion for DIY, how about using them to create simple garden furniture? A vertical garden is a great way to decorate a small space such as a roof terrace or balcony. Firstly, tape porous landscape fabric to the back, bottom and sides of a pallet and then add soil to the front spaces and top before planting your chosen bulbs or seeds. In spring your vertical garden will burst to life with a colourful flower display. Lay painted pallets side by side to create a ‘decking’ area in your garden. If you dig a patch of the lawn first, each pallet can be pushed into the earth to secure it. Your deck can be used to create a lovely seating area with garden chairs and a table. 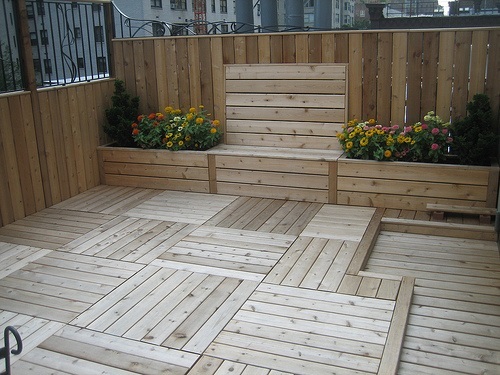 You could also enhance the area by growing plants and flowers in the spaces between the boards of wood. Used wood can be utilised to create simple garden furniture. Create a garden table by stacking and screwing one pallet on top of another. This can then be painted or varnished and casters added, enabling you to roll it indoors in the winter. You could even attempt to make a rustic bench or a place for tools by hammering legs on to your pallet. 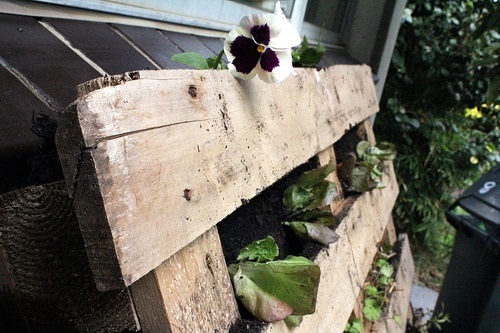 A wooden pallet could be used to make a compost heap, an animal run for guinea pigs or rabbits or even a chicken coop. You could also create items for the kids — perhaps a play house or a simple stage which they can paint themselves. Used wooden pallets can provide an innovative way to transform your home and garden and save cash in the process. They are easy to source and with a dash of creative flair they can be turned into eye catching masterpieces. They are light and easy to move, so perfect for rental properties or for those looking to make a garden more appealing when selling a home. They can be used as simple planters or vertical gardens or be used to create garden furniture or outdoor decorations. Pallet furniture is perfect for an eco-friendly home and garden. Recycled wood is sustainable and good for the environment and each pallet re-used will mean one fewer in the land-fill site.